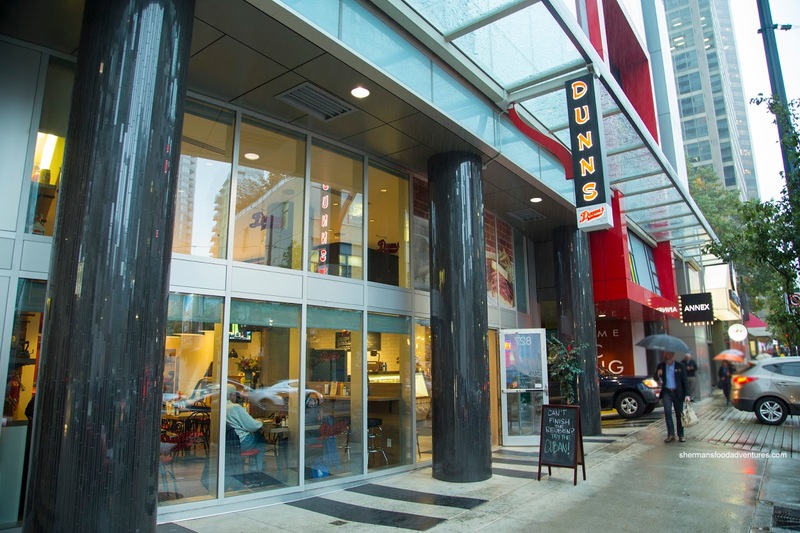 With Dunn's first foray into BC back in 2011, I was pretty stoked to sink my teeth into their buttery smoked meat. Ultimately, it was pretty good, but something was just not right. It was partly due to their other menu items, which were pretty mediocre. But the biggest reason for their downfall was the restaurant itself - it did not look like a deli and really didn't have anything in common with the Montreal locations other than the smoked meat. Fast forward to the present, we now see a relaunch focusing in offering a true deli experience. 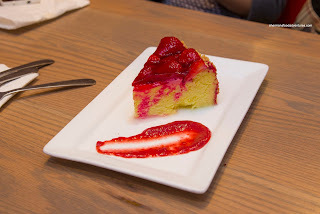 I met up with Diana, Amy and Joyce for a tasting of their menu prior to their relaunch. 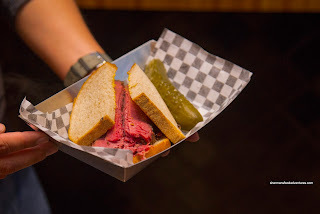 We got things rolling with the 4 oz Smoked Meat Sandwich sporting lean brisket. 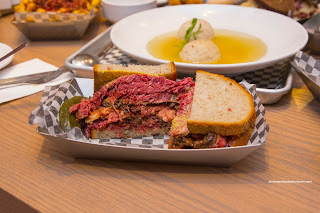 Despite the lack of fat, the meat was still buttery and meaty with a background saltiness. 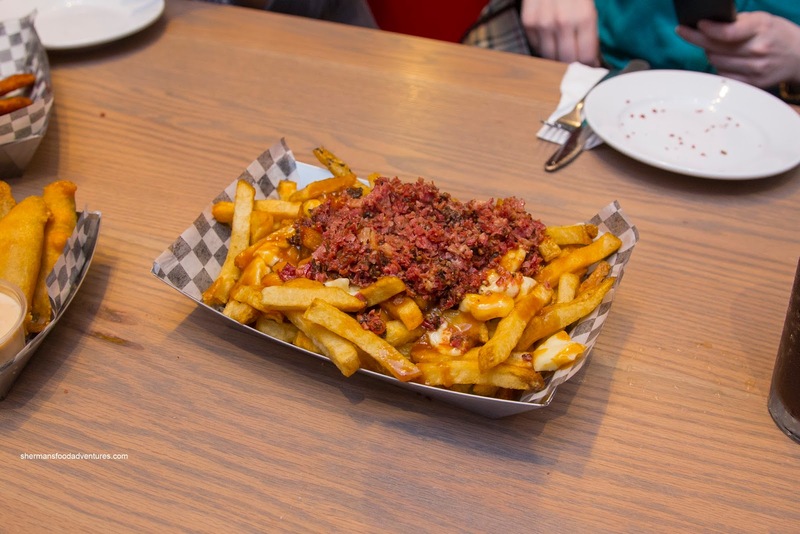 With only a streak of yellow mustard, it was definitely there, but not particularly impactful. For our first appie, we tried the Deep Fried Pickles with red pepper mayo. 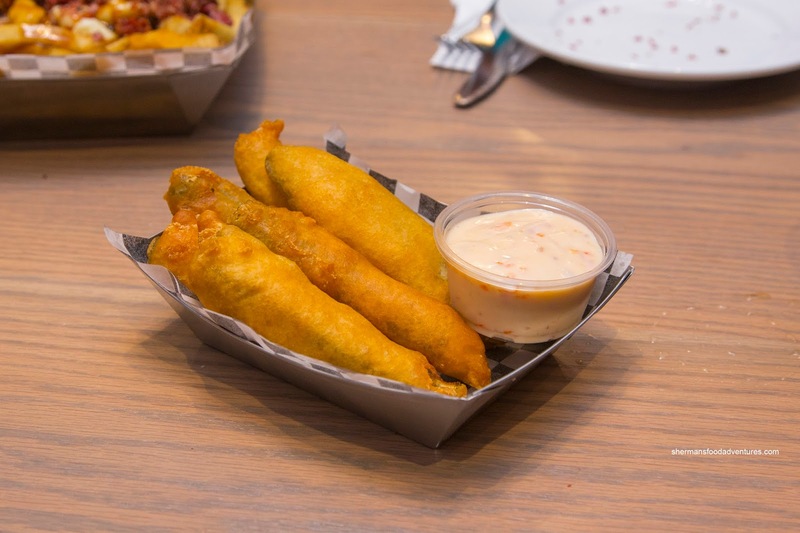 We felt that the beer batter was too thick here where the pickle was overwhelmed. The dip was good though with a spicy and sweet creaminess. 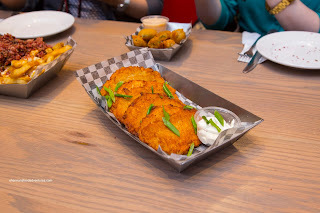 Moving along, we had the Latkes served with sour cream. These were slightly crispy and dense with a firm potato texture. It was intermittently interrupted by little nuggets of sweet onion. 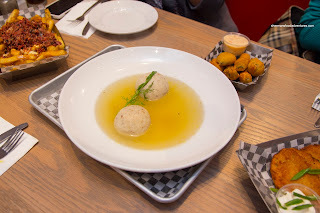 My favourite starter was the Matzoh Ball Soup. It featured 2 large matzoh balls which were soft and fluffy. They were not dense in the least, which made them easy and enjoyable to eat. I liked how they were served hot, which enhanced their texture. As for the chicken broth, it was decently flavourful without relying too heavily on salt. Of all the options for poutine, we selected the Dunn's Poutine sporting hand-cut kennebec fries, smoked meat, house-made gravy and real cheese curds. This was legit with crispy fries that stood up to the gravy and cheese. I liked the consistency of the gravy which was purposefully salty. The only thing I would've liked to see was more intact cheese curds. 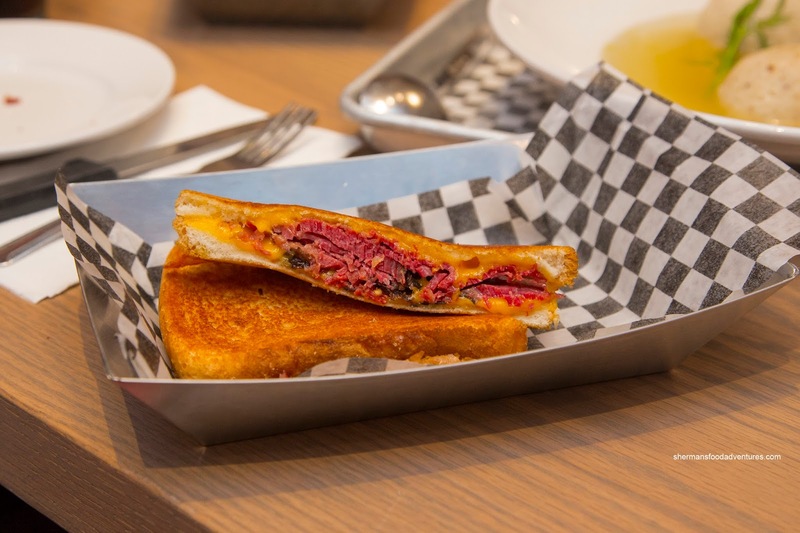 Out of curiousity, we tried the Smoked Meat Grilled Cheese. It was pretty good with medium fat meat with melted cheddar. The bread was nicely toasted up, yet the sandwich could've benefited from some mustard and/or thousand islands dressing. 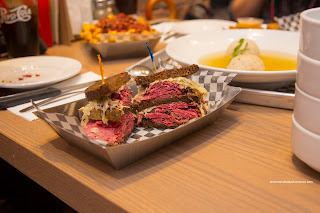 We weren't satisfied with 2 sammies, so we also got the Rueben featuring double meats stacked on dark rye with sauerkraut, Swiss and thousand islands dressing. The toasted rye held up well to the wet ingredients where there was just enough dressing. The good amount of medium fat meat was nicely balanced by the tart sauerkraut. To top it all off, we special ordered a 12 oz Full-Fat Smoked Meat Sandwich with Dijon. Oh yeah, that is what we were waiting for. Buttery and completely melt-in-our mouths tender, the meat was aromatic and nicely brined. We felt the Dijon was a better match with a more impactful zing. We ended the meal with the house-made Cheesecake with lime and vanilla. Although a bit crumbly, the texture was smooth and light. There was a hint of lime and a bigger hit of vanilla that provided enough impact without the aid of too much sugar. The strawberries were not subject to too much sugar as well, hence the slight tartness came through. 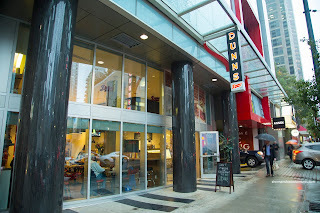 Overall, we enjoyed our meal at the "new" Dunn's. 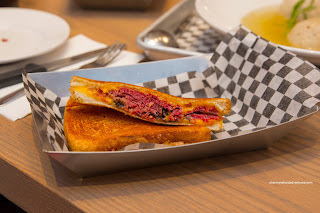 Sure, some of the appies were a bit clunky, but the most important items (the smoked meat sammies!) were completely on point and definitely satisfying.